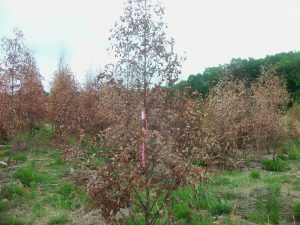 When a cold snap killed the Eucalyptus benthamii saplings, no one was surprised. As relative electrolyte leakage results predicted, temperatures below -13.4°C were fatal to the Eucalyptus benthamii saplings in the field trial. Photo by Peter Anderson, USFS. E. benthamii is one of the most cold-tolerant of approximately 700 Eucalypts. Still, it is maladapted to the North Carolina Piedmont, according to a recent USDA Forest Service study published in Forest Science. Before the cold snap, Butnor and his team had predicted the limits of Eucalyptus’ cold tolerance in the lab. The scientists used a technique called relative electrolyte leakage (REL) that measures the degree to which cell membranes are damaged after freezing. Electrolytes leak out of the damaged cell membranes, and can be measured with a conductivity meter. During the cold snap, temperatures reached -12.8°C. Unlike red spruce and some other native North American species, Eucalyptus cells cannot withstand such temperatures. At temperatures below -13.4°C, more than 50 percent of the cells in Eucalyptus leaves were irreparably damaged, as REL results showed. That amount of cell damage would almost certainly kill the plant. Loblolly pine, a native southern softwood species often grown in plantations, could withstand temperatures as low as -29.9°C, as REL revealed. There are over 700 Eucalypts, and some organizations are still evaluating E. benthamii and other species for cold-hardiness. Photo by BaroBert, Wikimedia Commons. The scientists also planted loblolly pine and eucalyptus seedlings on the Schenck Memorial Forest of North Carolina State University in Raleigh, NC. Seedlings were planted in April 2012, and that November the scientists began collecting biweekly measurements. As expected, the Eucalyptus seedlings grew much faster than the loblolly pine seedlings. Their photosynthetic rates also tended to be higher. Unlike loblolly pine, Eucalyptus can be coppiced, a very helpful trait for woody bioenergy feedstocks. 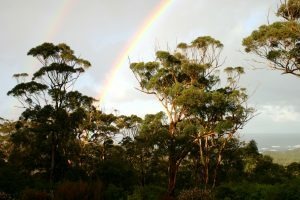 SRS scientists and others have raised concerns about Eucalyptus’ potential invasiveness and high water demand compared with native pines in the southern U.S.
Eucalyptus benthamii could be a profitable woody bioenergy crop in 12 percent of sites in its theoretical operational range, according to a recent study in Forest Policy and Economics. That team, which includes several former SRS scientists, defined the operational range to include USDA Planting Zones 8a and 8b. The field trial site on the Schenck Memorial Forest is farther north, in Zone 7b. 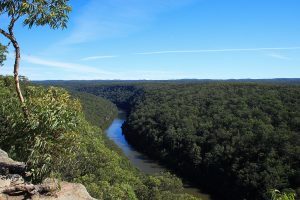 Eucalyptus benthamii is endangered in its native range along the Nepean River in New South Wales, Australia. Photo by Brian Yap, CC 2.0. Of course, Planting Zones change over time. Tree species in the South are migrating northward, as SRS scientists and others have previously shown. Read the full text of the Forest Science paper. Read the full text of the Forest Policy and Economics paper. For more information, email John Butnor at john.butnor@usda.gov.